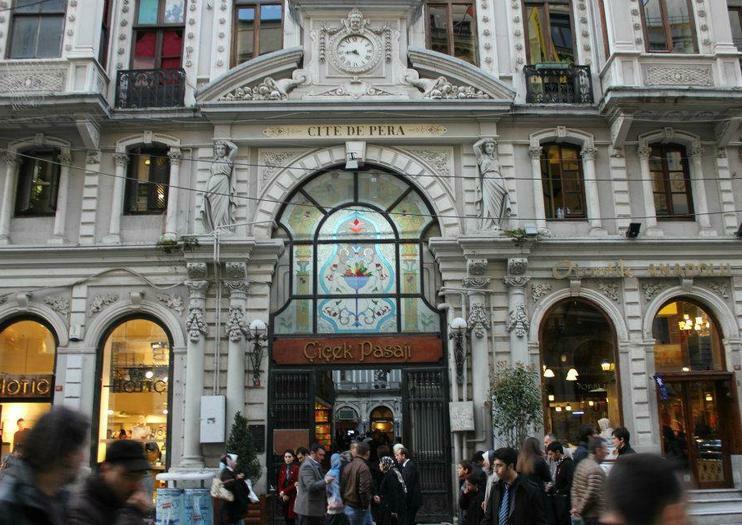 Cicek Pasaji was the most glamorous address in the Beyoğlu district during the heady days of the Orient Express, and today the historic 19th-century arcade is known for its restaurants and lively bar scene. Opened in the old site of the grand Naum Theatre in 1876, Cicek Pasaji was originally known as Cité de Péra, but following the 1917 Russian Revolution the galleria became known as Cicek Pasaji (Turkish for Flower Passage) because some of the newly-impoverished bourgeois Russian women who fled to Istanbul to start again began selling flowers here. By the 1940s, the new name stuck because by then, most of Cité de Péra’s buildings were occupied by flower shops. Once home to some of Istanbul's most glamorous apartments and stores, by the time of the Second World War, the exclusive shops had turned into rough and rowdy meyhanes (taverns). But the galleria has since been restored and refurbished, and a glass canopy was fitted in 1998, so that a visit to Cicek Pasaji will let you see the arcade’s grand Second Empire architectural style returned back to its original glory. Connecting İstiklal Avenue with Sahne Street in Istanbul's Beyoğlu district, the nearest metro to Cicek Pasaji is Taksim. Treat your palate to Istanbul’s exciting flavors on a 3-hour evening food walking tour. Follow a food-enthusiast guide around hidden streets and neighborhoods, and scout out the best food haunts the city has to offer. Taste treats such as 'borek' (flaky pastry); nibble on enticing ‘meze’ (small appetizers) at a ‘meyhane’ tavern, and savor ‘raki’, the locals’ beloved anise-flavored firewater. As you walk and eat, learn about Istanbul’s cuisine and the ingredients and influences that have shaped it. Numbers are limited to 12 for a more personalized atmosphere.